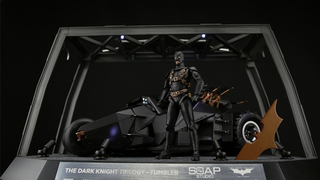 There's been many, many iterations of the Tumbler in merchandise form since Batman Begins came out, but this new 6-inch scaled kit from Soap Studio might just be the best one made. Seriously, it's insane. The model was at Toy Soul 2014 last month, and its laundry list of features is almost jawdropping in its completeness: 1/12 model is not only fully controllable as an RC vehicle through an iOS or Android App, but you can even use the remote control to mess with the LEDs dotted over the Tumbler, open and close the cockpit, and even mess with the spoilers. You can even go a step further and use the functioning turbo boost - which not only has the accompanying sounds and lights from the movie, but actually increases the speed of the Tumbler by around 30%. As if this all wasn't crazy enough, the damn thing also has a voice intercom, and through the Tumbler-interface-themed apps, you can access a 480p camera embedded in the vehicle to record footage (normal or in night-vision mode) and take pictures. Oh, and it can record a path and follow it, because JESUS CHRIST HOW MUCH MORE CAN THIS DAMN R/C CAR DO. The Tumbler also comes with an accompanying 6" Batman figure, modelled off the suit that appeared in Begins (pre-orders taken at Toy Soul got the alternate head and chest piece to create Bruce's first 'masked' appearance in the movie, too) - who is fully articulated, so you can fit him in the Tumbler, and comes with multiple heads, hands, capes and accessories. Seriously, this figure would be amazing on its own, the fact that it's an accessory to this absurdly incredible Tumbler just makes this whole thing even more crazy. Mop yourself up though, because you've not heard the price. This Deluxe Tumbler is available now from Soap Studio's website for a whopping HK$4,980 - that's $642. A crazy price to match a truly crazy Tumbler. You can also buy a 'Driver' version that's just the Tumbler, sans Batman figure or display base, for a mere $513. But really, if you're already willing to pay this much already, you might as well go whole hog and get the deluxe pack. That Batman figure looks pretty damn sweet.